A legacy of family violence and sexual abuse haunts the desperate characters who populate this melodramatic first novel by an award-winning playwright. Ray Johnson, youngest son of a wildly dysfunctional rural Michigan family, narrates—in a sometimes laconic, sometimes drunkenly agitated voice—the events following and preceding the brutal murder of his older brother Billy, an intemperate good-for-nothing who had mercilessly battered and exhausted his long-suffering wife, children, and relatives. 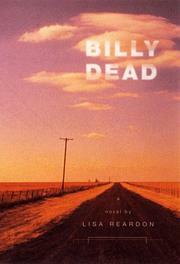 In the three days between Billy’s death and his funeral, while the local sheriff investigates significant clues left at the murder scene, Ray recalls the endangered years he and his siblings endured, his stormy relationship with his tough younger sister Jean, and his own understandable reasons for wishing “Billy dead.” Reardon thus presents her novel’s events via a skillfully handled backward-and-forward structure that keeps us guessing about the killer’s identity and, specifically, whether Ray is indeed so out of control that he may have committed fratricide and been unable to remember it. There’s ample reason to suspect him: he experiences moments when animals (a huge raccoon, his beloved dog Samson) talk to him, and he hallucinates Billy’s ghost in a scene that appears to be pure guilt fantasy. But the story moves in several directions simultaneously, powered by crisp, often grimly funny dialogue (a dim-witted neighbor assures Ray “I’ll tell you who killed him . . . . It was that bunch of Satanists over to Clark Lake”) and vivid characterizations of secondary figures (a likably senile centenarian is the best of several such). But the novel labors to kayo us: the Johnsons’ various pitched battles are luridly over the top, and the story climaxes with the arrest of Billy’s murderer and a (not-to-be-believed) getaway crowned by a promise of escape, even renewal: it’s as if Thelma and Louise had settled for so-so husbands and lived happily ever after. Vivid and often gripping, but unmodulated, and finally not very convincing.